House with 5 bedrooms, 3 bathrooms. Open concept for kitchen, dining room and living room. 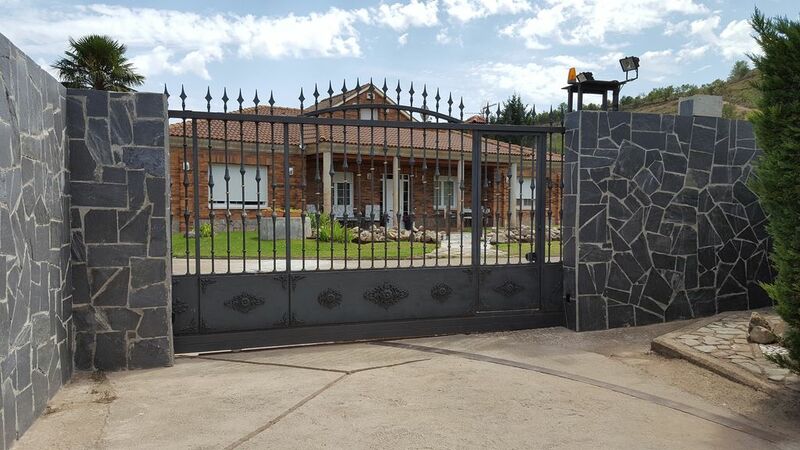 Beautiful country house where much of the Valle del Iregua be seen. ideal location for visiting both the city of Logroño 7 km as the Sierra de Cameros to 20Km.. The rioja Alavesa is just 15 Km. Building on one level consisting of living room, dining room and kitchen in an open space and another area of ​​5 rooms, one attic bathroom in the room and communicating without door by a spiral staircase with room plant low . It has heating throughout the house and fireplace in the living room. Air conditioning in master bedroom. TV in living room and two bedrooms. full kitchen dishes, glasses, pots, pans etc ... In the kitchen dishwasher, two refrigerators, oven, microwave, toaster, blender, etc ... It has a pool, one for adults and one for small children with changing rooms. Outdoor picnic area, BBQ, football pitch, football, table tennis ... Parking Outdoor indoors for 4 cars inside the property. The porches is furnished dining for both one use to use relaxing. Sun loungers and mattresses for the pool and enjoy the sun. The house and location were fantastic. The owners are very friendly and came to fetch us when we got lost on the way! The pool is not heated and was a bit cold for one of our kids, though the tougher one loved it! This was a wonderful choice for us. The house is big and well-maintained. Una casa espectacular, un sitio tranquilo y con aleededores muy interesantes! El trato impecable! We had a wonderful stay. The house was spacious with lovely grounds. Elena and her family were fantastic. One of our party had terrible toothache during the stay, Elena’s husband very kindly took her (originally to the dentist) then to the doctor as she had an infection. He helped with the communication, translation and transport. The location is perfect for heading out for a walk in beautiful countryside and visiting the numerous bodegas. Logroño is only 10 minutes away and great places to visit like Laguardia is only half an hour away. House located 7 Km. Of Logroño and 500 meters from the town Alberite. Opportunities to visit wineries within 7 to 40 km. At a distance of 40 K. well.The Monasteries of Suso and Yuso in San Millan and traces of dinosaurs Enciso. Beautiful natural landscapes such as the Sierra de la Cebollera, the Old and the New Cameros. Excursions to the ski resort of Valdezcaray. Visits Old city of Logrono and fabulous tasting in the famous Laurel Street. No se admiten despedidas de solteros/as,animales dentro de la casa ni fiestas privadas en la propiedad.